I'm almost afraid to post this . . . but I'm finally back into a groove with laundry. Woooo Hooooo!!! When I had 2 in cloth diapers, laundry was NO problem. Every day, I would do a load of diapers, and a load of laundry. On Sundays, I did no laundry. 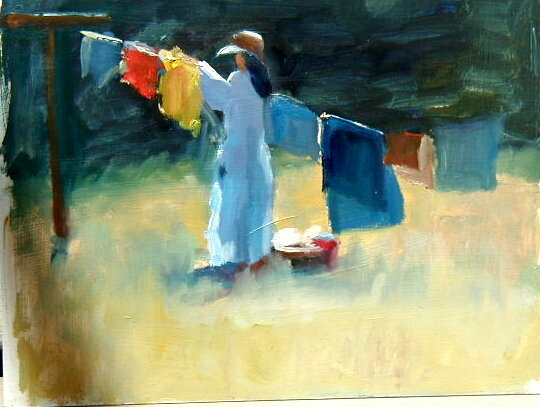 I had a schedule of what was washed each day, and often hung the loads outside to dry. I was the laundry queen!! I think I started losing control of it when Nate stopped using diapers. Probably not right away, but suddenly I didn't NEED to throw in a load every day. Before I knew it, I was doing 4 or 5 loads in a day; or just washing the bare minimums. It would frustrate me, but for whatever reason, I just never got back in control. Until the last few weeks. I have started regaining control of various areas of the house - maintaining instead of frantic, frenzied cleaning every once in a while. And, today, when I went to the laundry baskets and realized I only had sheets to wash (and Friday has always been bedding day) I realized I was back in the groove. It feels almost ridiculous to feel so good about it . . . but it feels great all the same! What a pretty picture! I'm glad you're back in the groove. While I'm visiting, do you mind if I ask your advice on cloth diapers? What type would you recommend for a first-timer, and what price would be good to pay per diaper, secondhand?